Take these tasty sesame noodles to your next office potluck or picnic and treat your friends to a taste of the Far East. They’re delicious and easy to make. 1. Cook the pasta according to the package directions. Drain. 2. Combine the remaining ingredients in a bowl. Pour over the cooked pasta; toss to combine. Refrigerate until ready to serve. Here’s a simple side dish with an Asian twist. 1. In a large bowl, whisk together soy sauce, rice vinegar, sesame oil, agave nectar, and salt and pepper; set aside. Steam broccoli florets until just tender; set aside to cool. In a large skillet, toast sesame seeds. 2. Add broccoli florets to bowl with dressing; stir to combine. Let sit at room temperature until ready to serve (up to 2 hours). Sprinkle with toasted sesame seeds right before serving. Love the romance (and the fragrance) of Creole flavors but not the meats (sausage and bacon grease) usually included in Creole cooking? We have a solution for you: Vegan Creole! This sauce has a tomato base and uses the “Holy Trinity” of New Orleans cooking: green peppers, onions, and celery. Mix in the chili powder and Tabasco® sauce for spicy heat, and you’ve got a regional Louisiana flavor! You can change the heat level by adjusting the amount of Tabasco® and chili powder. Serve over rice, add authentic muffaletta bread, and later cool your palate with some pecan praline frozen soy yogurt for dessert. Note: Check the label on your brand of Worcestershire sauce because some contain anchovies. Vegan versions are available. 1. Sauté the onion, green pepper, and celery in oil in medium cookpot until onion is transparent. Add garlic and stir. Add tomatoes, tomato sauce, and spices. Add salt and pepper to taste, and simmer 30 minutes, stirring occasionally. 2. Mix cornstarch with 2 Tbs. COLD water and stir into cookpot. Let simmer another 10 minutes, stirring occasionally. Remove bay leaf. Serve over hot cooked rice. Serves at least 6. Save this dish for a chilly winter evening—it’s the ideal comfort food. Serve with Spanish rice and a spinach salad. 1. Preheat oven to 350°. In a medium saucepan over medium heat, combine first seven ingredients. Heat for about five minutes, stirring occasionally. Add oregano, cumin, and chili powder. Continue cooking until mixture is heated through. 2. Meanwhile, lightly grease a 13 x 9 (or similar size) baking dish. Pour about ½ cup of the enchilada sauce in the baking dish and spread evenly. Heat tortillas in the microwave for about 30 seconds until they are soft and pliable. 3. Scoop about a cup of the enchilada filling into the middle of a tortilla. Roll your tortilla, fold ends under, and place seam side down in the baking dish. Continue until the filling is used up. Pour remaining enchilada sauce over rolled up tortillas. Sprinkle with vegan soy cheese if you like. Bake for about 15 minutes, until the cheese is melted and the sauce is bubbly. Serve with vegan sour cream and a side of salsa. 1. Heat oil in a large skillet. Sautè the onion until translucent (about 5 minutes). Add bell peppers and jalapeño; stir to combine. Add 1/4 cup water, and cover skillet. Cook for about 5 minutes, stirring occasionally. 2. Remove cover and add spices, mushrooms, and baked tofu. Cook, stirring occasionally, until the mushrooms are tender and the tofu is heated through (about 5 minutes). If desired, begin warming the tortillas (either wrapped in foil in the oven or wrapped in paper towels in the microwave). 3. Transfer fajita mixture to a large bowl. Allow guests to top their tortillas with the fajita mixture, vegan sour cream, sliced avocado, diced tomatoes, and cilantro. Olè! This is a great way to use day-old bread, and according to the Armenians, the only way to ingest such massive amounts of raw garlic and enjoy it. Jill in Boulder, Colorado submitted this recipe. 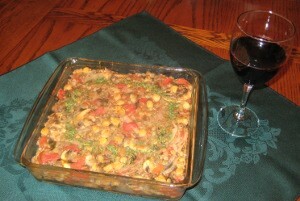 She says that this recipe is one of several gifts from her dear friend and brother Spice, a vegan gourmet chef. Jill advises against kissing or engaging in any close-talking with non-eaters of this raw garlic dip soon after you indulge in the intense garlickyness. Soak the bread in enough water to more than cover it, and then squeeze out the extra water and set the bread aside. In a food processor, mix the garlic, salt, lemon juice, and oil until the garlic is pureed. Add the bread and run until the mixture is homogenous. Refrigerate several hours to allow flavors to develop. Note: The garlic has a preservative quality that allows this dip to keep at room temperature in a sealed jar for about two weeks. In the refrigerator, it will keep at least as long, with a gradual intensifying of flavors that is desirable. 1. Thaw peaches; drain and reserve juice. 2. Preheat oven to 350°. Put vegan margarine in 9 x 13 glass cake pan and place in preheated oven. While margarine melts, mix batter. After margarine is melted, remove pan from oven and pour batter on top of melted butter. Carefully spoon peaches and juice over batter. Bake for 35-45 minutes. Batter will rise up around peaches. This delightful breakfast dish is baked in the oven, warming your kitchen on a chilly morning and scenting your home with a cinnamon fragrance. You’ll love it! 1. Preheat oven to 400°. Coat a medium-size baking dish (8″ x 8″ or larger) with margarine or canola oil. 2. Mix first five ingredients together in a large mixing bowl. Stir in oats, cranberries, and walnuts. Pour into baking dish. Cover and bake for about 35 minutes or until most of the liquid is absorbed and the oats are tender. Substitution suggestions: Instead of cranberries, try dried currants, golden raisins, or dried apricots. Try toasted almonds or pecans instead of walnuts. Glogg, a traditional drink of the Scandinavian Advent season, is like mulled wine. The varieties of glogg recipes could boggle one’s glogg-addled mind (try saying that three times quickly), but basic glogg consists of red wine with spices and a combination of other spirits and fruit juices. We here in the Ethnic Vegan test kitchens were happy to experiment with a number of recipes until we hit on a great-tasting result that will knock your winter socks off. Plan to make the spice mix at least 24 hours ahead. Cardamom and nutmeg seedpods may be hard to find; you can substitute ground, if necessary. Heat to the simmer stage, but do not boil! Serve warm. Place all ingredients in a small saucepan, and cover with wine. Bring to a boil, remove from heat, cover, and let stand (unrefrigerated) for at least 24 hours. Heat until steaming (don’t boil!). Stir before serving; solids will have settled to the bottom. Sue and I were curious as to where rice pilaf originated, and a quick Web search revealed a long, complex history for this dish. (The short answer: the Middle East and Central and South Asia.) Prepare our brown rice pilaf with pine nuts (and a creamy sauce) and think about how many people before you have enjoyed a similar dish throughout history. 1. In a small skillet, heat oil over medium heat. Add onion and garlic; cook, stirring, until onion is golden (about 5 minutes). Add rice and sautè for 1 minute. 2. Add broth, water, wine, mushrooms, thyme, and salt. Simmer until rice is tender and most of the liquid is absorbed (about 50-55 minutes). Check rice occasionally and add water if necessary. 3. Let stand for 5 minutes. Mix in pine nuts immediately before serving. There are myriad varieties of dal, many of which include lentils. The spices used in this dish can vary quite a bit and can include curry powder, garam masala, or even tamarind or mango. Dal is served often in Indian households (sometimes more than once a day). Lentils are packed with fiber, complex carbohydrates, magnesium, folic acid, and iron, but they’re low in calories and fat. Lentils are high in protein – just add grains, nuts or seeds to your meal for a complete protein. 1. Place lentils and ginger in large cookpot, cover with water, and bring to a boil. Reduce heat and simmer for 35 to 45 minutes until lentils are tender. Add salt. 2. In a separate pan, heat oil and sautè onions over medium heat until they start to brown (about 12-15 minutes). Reduce heat; add chili powder, cloves, and pepper; stir until combined. 3. Add onion mix to lentils in the cookpot and stir. Serve over a bed of rice and sprinkle with cilantro. You may want to add a dollop of vegan sour cream. We love the complex spice blends of Indian food. This recipe captures the flavors we love so much without requiring long hours in the kitchen. In fact, it’s fast enough for a weeknight meal. 1. In a large cookpot, sautè cauliflower and potatoes in oil on low heat for 8 to 10 minutes, adding more oil if necessary. Remove from heat and cover. 2. Heat 1 tablespoon of olive oil in a small saucepan. Sautè all spices over medium heat for 2 to 3 minutes. Add tomato sauce and peas, and blend well. Add to cauliflower and potatoes and stir. Remove bay leaves and sprinkle with cilantro just before serving. “Of course everyone in Spain calls his or her recipe ‘authentic’ gazpacho, but they’re all different,” says John from Phoenix (part of Sue’s extended family). John’s recipe has received rave reviews from every person who’s tried it, so we’re dubbing his version authentic! This delicious raw-veggie recipe is not only healthy, but it’s also quick. Just throw everything in the blender. If you like raw onion, feel free to add more. English cucumbers are long, skinny cucumbers with few seeds; you can substitute another type if you wish. If you like your gazpacho hot and spicy, use less tomato juice and more spicy vegetable juice or Bloody Mary mix. 1. Reserve a few tablespoons of zucchini, bell pepper, and cucumber for a garnish. Combine all remaining ingredients in a blender except olive oil and bread crumbs. If your blender has a small capacity, process in batches. After everything is purèed, add olive oil and bread crumbs to blender (this adds a nice texture to the soup). Mix well. 2. Serve ice cold in chilled bowls, and top with a dollop of vegan sour cream and reserved chopped veggies. The pine nuts in this quick, simple recipe really stand out amid the simple blend of vegetables. Use Italian flat-leaf parsley if you can (it has a better flavor than other varieties and is not bitter). The results are delizioso! This dish is especially good with a loaf of crusty Italian bread and a Tuscan red wine, such as Chianti. 1. Cook pasta according to package directions. Drain and set aside. 2. In a large saucepan, sautè the celery in olive oil for about 3 minutes. 3. Add eggplant, tomatoes, Italian seasoning, and 1/4 cup water. Cover and cook on medium heat until eggplant is tender, about 15 to 20 minutes, stirring occasionally. Add more water if necessary to prevent sticking. 4. In a separate bowl, combine tomato paste, vinegar, 1/4 cup water, salt, pepper, and sugar. Add to eggplant mixture. When eggplant is tender, remove from heat and stir in pine nuts, parsley, and pasta. Chill before serving, but keep in mind that gently heated leftovers taste great as well. Savor the smoky barbeque taste in this veggie chili. The Portobello mushrooms add a nice “meaty” taste. 1. Heat canola oil in a large stewpot over medium heat. Sautè onion, garlic, and celery until onion is translucent. Add vegetable broth and tomatoes, and stir to combine. 2. Add next nine ingredients (mustard through Worcestershire sauce), and stir to combine. Increase heat and bring to a boil. Reduce heat to low; cover and simmer for 20 minutes. 3. Add chili beans, pinto beans, and chopped Portobello mushrooms. Stir to combine. Cover and simmer for an additional 15 minutes or until all vegetables are tender. Serving suggestion: Serve with Beer Batter Bread. Ruth and Sue slaved over a hot stove to perfect this labor-intensive recipe. (Yes, it takes a while, but it’s worth it. Even the leftovers are delicious!) Feel free to substitute 1 cup sliced carrots for the yam or the cauliflower. Too much kofta ball batter? You can use the leftover batter for soup, along with the cooking liquid from the vegetables. You’ll find the chickpea (gram) flour, garam masala, and asafetida at an Indian grocery store or well-stocked supermarket. Place all ingredients in large saucepan over medium heat. Stir well. Keep warm until kofta balls are ready. 1. Place yam, potatoes, and cauliflower in a large cookpot with vegetable broth. Add water to cover; bring to a boil. Reduce heat and simmer for 1 hour. 2. Drain vegetables, saving water for tomorrow’s soup. Add peas and mash until well blended. Add flour, baking powder, and spices, and stir to combine. 3. Drop golf-ball size lumps into a few tablespoons of olive oil and fry until brown, about 3 minutes per side. (Partially cover the pan to reduce the mess.) Place cooked kofta balls into tomato sauce; mix gently. 4. Serve over rice or fresh linguini. Colorful and loaded with vitamins, this Caribbean stew reveals its African origins by the addition of yams, okra, and peanuts. It’s a flavorful blend of textures that pleases the palate. Try this dish served with slices of crusty bread and a crunchy salad — and maybe a colorful drink with a little umbrella in it. 1. In a large stewpot, sautè the onions in olive oil on medium heat for about 5 minutes. 2. Add the next five ingredients, including yams. Add water if necessary to cover vegetables. Cover pot and bring to a boil. Reduce heat and simmer on medium-low heat for 6-10 minutes, until yams are barely tender. 3. Add salt, tomatoes, okra, and lime juice. Simmer about 15 minutes, and then stir in cilantro. 4. Transfer the stew into a decorative serving dish, if desired. Sprinkle with chopped peanuts and a few sprigs of cilantro before serving. Ruth created this winter wonderland of pasta and beans with a spicy tomato-based sauce. We’ve all tried this dish and loved its color and flavor. It’s satisfying and perfect for a cold winter day. 1. Heat oil in a large, heavy soup pot over medium heat. Add onion, green pepper, and garlic. Stir and cook until tender, about 5 minutes. 2. Add remaining ingredients except pasta; then increase heat to high. When soup begins to boil, stir in pasta and reduce heat to medium. Cook for 10-15 minutes or until pasta is tender. Serve with a salad and artisan bread. This soup will thicken while in the refrigerator, so add water or broth when reheating leftovers. This soup began as plain ol’ potato soup. It changed along the way, thanks in part to the Herbs de Provence spice blend brought back by a friend from a trip to France. Peel and chop potatoes, carrots, and onion and place in large soup pot. Add vegetable broth, and cook on medium heat for 30 minutes or until potatoes and carrots are tender. Add broccoli and creamed corn, lower heat, and simmer another 10 minutes. Add chard, spices, and salt. Simmer another 10 to 15 minutes. Add additional water or broth if desired. Serve with a loaf of crusty French bread, sliced diagonally into large chunks, and pretend you’re having dinner on the south coast of France. This recipe is not difficult (don’t be put off by the long list of ingredients). Prepare all items in advance, including slicing the tofu. For best results, rinse the tofu block, and then stand it on its side and slice the narrowest edge into four slices. Then lay it flat and cut into about 2-inch cubes. The slices will be 1/2-inch thick and will cook more evenly. 1. Place 2 Tbs. olive oil, onion, ginger, and garlic into heated large cook pot or dutch oven. Stir occasionally until onion is transparent, about 3 minutes. Add remaning olive oil and tofu and cook until tofu is lightly browned. Add a bit more oil, if necessary. 2. Add coconut milk, pepper flakes, paprika, curry powder, soy sauce, agave nectar, and salt. Stir well. 3. Spread carrot slices on top, and add spinach leaves. Cover tightly and cook on low heat for 15 minutes. Mix before serving over rice or noodles. There are as many versions of moussaka recipes as there are vegetables to add to this hearty dish (see another version here). Some versions of this dish are made with potatoes instead of eggplant, and some add zucchini. In England, sometimes a layer of mashed potatoes is used on top instead of cheese. This vegan version is filling and delicious, especially when served with a chunk of crusty bread. It’s great for an early fall supper when the nights start getting cooler. 1. Place lentils, stock, and bay leaf in a small saucepan. Cover and bring to a boil. Reduce heat and simmer about 20 minutes or until lentils are tender. While lentils are cooking, oil an 8″ x 8″ baking pan; set aside. Drain lentils and set aside. 2. Heat 3 Tbs. olive oil in a large saucepan. Slice the eggplant into 3/8-inch slices. Cook the slices until lightly browned, about 3 to 4 minutes per side. Set slices aside. 3. Preheat oven to 350°. In the same saucepan, heat 2 Tbs. olive oil. Add onion and garlic, and sautè for about 5 minutes. Add lentils, mushrooms, garbanzos, tomatoes, Italian seasoning, and 1/4 cup water. Simmer gently for 10 minutes, stirring occasionally. Add salt and pepper. 4. Place half of the eggplant slices in the baking dish. Spoon half the lentil mixture over the slices. Repeat with remaining eggplant slices and lentil mixture. Bake for 35 minutes. Sprinkle cheese on top and bake another 5 to 10 minutes until cheese is melted and dish is bubbling. Garnish with parsley and serve immediately. Variation: If you’re not a fan of non-dairy cheese, try the English version of moussaka and add a top layer of mashed potatoes before popping in the oven. Our friend Paula from Montana can promote the health benefits of Montana red wheat berries ’til the cows come home. She swears that they have magical properties. Whole unprocessed wheat kernels, especially Montana organic red spring wheat berries, are high in protein and fiber, and they’re delicious! This colorful salad recipe showcases their nutty goodness, and it’s perfect for a summer potluck. 1. Rinse wheat. Combine wheat, water, and salt in a saucepan. Bring to a boil, reduce heat, cover, and simmer 1 hour or until tender. Drain and cool. 2. Combine all ingredients with cooled wheat berries. Mix and serve. You can never have too many salad recipes in the summertime. Mix all salad ingredients in a large bowl. Pour dressing over salad, toss, and serve. Tabbouli, tabbuli, tabouleh: how many ways can you spell the name of this crunchy, nutritious salad? It’s a refreshing yet filling dish that’s especially good in the summer. Tabbouli salad’s main ingredient is bulgur (cracked) wheat. To prepare bulgur wheat for the salad, measure 1 cup bulgur into a bowl, and then pour 1 cup warm water over it and let stand for 30 minutes. Yields 2 cups. 1. Mix first seven ingredients together (bulgur through salt), and then add fresh lemon juice. Stir to combine. 2. Refrigerate ingredients for about an hour. When ready to serve, add olive oil and black pepper. Mix well. Notes: Fresh ingredients are absolutely necessary for good tabbouli. A large lemon usually nets 1/4 cup of juice. A large bunch of fresh parsley can yield 1, 2, or 3 cups chopped; use as much as you want. Cold-pressed, extra virgin olive oil is best for salads, and although mint leaves add a unique flavor, they can be omitted in a pinch (sometimes it’s hard to find fresh mint). Cooking is an art, not a science, so have fun and experiment! Place all ingredients into a large bowl. Mix and allow flavors to marry for an hour before serving. This mild dip is perfect for dipping fresh veggies. Try baby carrots, zucchini slices, celery sticks, broccoli and cauliflower florets, asparagus spears, mushrooms, bell pepper slices, or cherry tomatoes. If you prefer spicy dips, try adding a dash of your favorite hot sauce for an extra kick. Add beans, lemon juice, olive oil, oregano, and salt to the bowl of a food processor and blend until smooth. Transfer mixture into a small serving dish. Drizzle with additional olive oil and sprinkle with a little oregano or parsley. Dip your veggies! If you have one of those little gadgets that can peel, slice, and core apples in just a few seconds, this recipe is a good reason to bring it out and use it. 1. In a small bowl, mix flour, cinnamon and nutmeg. Set aside. Place one pie crust in pan on a cookie sheet covered with aluminum foil. Set aside the other crust on waxed paper. 2. Peel, core, and slice apples, and place in a large bowl. Toss with lemon juice. Pour agave nectar over apples and mix well. Sprinkle flour & spice mixture over apples and mix again. 3. Turn apples into pie crust (apples will mound up in the center). Place the other crust atop apples, crimp edges of crust, and trim excess. Cut a few slits in top crust for steam to escape. Bake at 375° for 55-60 minutes. 1. Heat the canola oil in a large skillet over medium heat, and sautè the onion, bell pepper, and garlic for about 5 minutes. Add cumin, chili powder, and salt. Stir to combine. 2. Add tomatoes, kidney beans, and frozen corn. Bring to a boil; reduce heat and simmer for about 15 minutes, stirring occasionally. Add cooked pasta and “beef” crumbles, if using. Serve immediately. My corn tortillas weren’t cooperating. I had envisioned a beautiful pan of tightly rolled enchiladas smothered in sauce, but despite being dipped in sauce and allowed to soften, my tortillas were cracking and slowly unfolding. I changed course and sliced the tortillas, layered the ingredients, and then smothered with the sauce. The resulting casserole was much quicker than rolling enchiladas, and it tasted great. 1. Preheat oven to 350°. Lightly oil a 13″ x 9″ baking dish. Spread 1/4 cup of enchilada sauce over the bottom of the dish. Set aside. 2. In a large saucepan, heat the olive oil over medium heat and sautè the onion until translucent. Add garlic, chicken substitute, mushrooms, and spices. Cook, stirring frequently, for about 5 minutes. (Add some vegetable broth or water if the pan becomes too dry.) Stir in green chilies and sour cream. Remove from heat. 3. Empty remaining enchilada sauce into a large bowl. Dip half the tortilla slices into sauce, coating thoroughly. Line bottom of pan with tortilla slices. Spoon “chicken” and mushroom mixture over tortilla slices. Cover with remaining tortilla slices, and spoon remaining enchilada sauce over slices. Top with vegan cheese if using. Cover pan with foil and bake for about 25 minutes. Remove foil and bake for additional 5 minutes. Top casserole wedges with salsa and fresh cilantro, if desired. 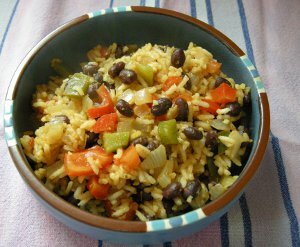 Side dish idea: fiesta beans and rice. Be sure to use both red and green bell peppers for a colorful, festive side dish. 1. In a large saucepan, sautè the onion and bell peppers until the onion is translucent. Add garlic, vegetable stock, chili powder, oregano, cumin, coriander, and black beans. Bring to a boil. Cover, reduce heat, and cook for 10 minutes. 2. Stir in rice and season with salt, freshly ground pepper, and hot sauce (optional). Cook until heated through. Garnish with fresh, chopped cilantro if you like. Did you know that “pronto” is Italian for “quick”? After a hard day of work (or maybe a weekend shopping spree), this one-pot pasta dish makes a satisfying supper. Place all ingredients into a large stewpot. Bring to a boil. Reduce heat and simmer uncovered, stirring occasionally, for about 15 minutes or until pasta is al dente. Serve with a green salad and fresh Italian bread, and maybe a glass of Chianti. Roasting the red bell peppers results in a sweet, slightly smoky flavor. Accompanied by a salad and crusty peasant bread, this soup makes a great light supper. 1. Preheat broiler. Cut bell peppers in quarters; trim and discard seeds. Place quarters on a foil-lined baking sheet. Broil for about 10 minutes or until skin blackens and peppers soften. Place peppers in a paper bag. Roll the top of the bag over to seal, and set aside for about 10 minutes. 2. Heat oil in a stewpot over medium heat. Sautè the onion, celery, carrot, and garlic for about 7 minutes. While the vegetables cook, peel the blackened skin from the roasted bell pepper quarters and coarsely chop. Add peppers to stewpot, along with vegetable stock. Add tomato paste and spices and bring to a boil. Cover, reduce heat, and simmer for about 15 minutes. 3. Use your favorite method to puree the soup: blender, immersion blender, or food processor. Heat for an additional 5 minutes. Ladle soup into serving bowls. If you enjoy Indian food, you’ll love this spicy red lentil soup. We’ve replaced the yogurt that is traditionally used in Indian cuisine with Tofutti Better Than Sour Cream. Delicious! Look for lentils in the bulk foods section of your natural foods store. 1. Stir lentils and vegetable stock together in a soup pot; bring to a boil and reduce heat. Cook until lentils are tender (about 25 minutes). 2. Combine about 2 cups of lentils and broth with Tofutti Better Than Sour Cream in a blender. Process until smooth. Return to soup pot and combine with remaining ingredients. Cook until heated through. Serve with a garnish of diced red bell peppers. Here’s a veganized version of a holiday classic. Preheat oven to 425°. Rinse tofu and place in blender or food processor. Process on medium speed for about 1 minute until creamy. Add pumpkin, agave nectar, salt, and spices. Process for an additional 2 minutes. Pour mixture into unbaked pie shell and bake for 15 minutes at 425°. (You may need to cover crust with foil to prevent burning.) Lower heat to 350° and bake for another 45-50 minutes. Chill and serve. These fries are a great accompaniment to portobello mushrooms or veggie burgers from the grill. Add vegetarian baked beans and mom’s sweet and sour pepper slaw for a genuine picnic supper! 1. Preheat oven to 450°. Thoroughly scrub potatoes. Leaving skins on, cut potatoes lengthwise into a 3/8″ square French-fry shape. 2. Whisk oil and seasonings together in a large mixing bowl. Add sliced potatoes, gently tossing to coat slices evenly (or mix with your fingers). Arrange potatoes on a baking sheet in a single layer. Bake 45-50 minutes, until potatoes are crispy and golden brown. Serve hot. “Florentine” can be roughly translated as “in the style of Florence,” and dishes with this name in the title often contain spinach. Bring the style of Florence to your table with this tasty soup. 1. Heat oil in a large stewpot over medium heat. Sautè onion and celery until onion is translucent, about 5 minutes. Stir in garlic, broth, tomatoes, and tomato paste. Bring to a boil; reduce heat and simmer for about 20 minutes, stirring occasionally. 2. Add pasta shapes. Cook about 10 minutes. Add spinach and cook until pasta is done. Add sugar, salt, pepper, and basil, and stir to combine. Ladle into serving bowls. Making homemade pizza is definitely more time-consuming than popping a frozen pie in the oven, but once you taste your homemade creations, you may never go back to the store-bought varieties. Even if you’ve never made dough from scratch, you’ll quickly get the hang of it. 1. In a large bowl, add warm water to yeast and sugar. Set aside for about 5 minutes. In the meantime, grease a medium-size bowl with olive oil. Add olive oil, salt, and 2 3/4 cups flours to yeast mixture. Stir with a wooden spoon until combined and dough pulls away from side of bowl. 2. Sprinkle flour over a work surface; slowly incorporate remaining 1/4 cup flour and knead dough until smooth and elastic (about 10 minutes). If dough sticks to your fingers, slowly add more flour. 4. Divide dough in half and roll out on a floured work surface. Fit dough into prepared pizza pans. Cover with pizza sauce and your favorite toppings. Bake at 450° for about 15 minutes or until the bottom of the crust is lightly browned and toppings are thoroughly cooked (you may want to switch to the broiler setting for the last few minutes of baking to thoroughly cook the toppings). Pass out the napkins and enjoy! Look for hominy (also known as posole or pozole) in the Mexican foods section of your supermarket, or visit your local Latin American grocery. This recipe makes 24 enchiladas, enough for a party or leftovers for lunch. 1. Preheat oven to 350°. Grease two 9″ x 13″ baking dishes (or equivalent) and set aside. Heat the canola oil in a large saucepan. Sauté the onion, bell pepper, and garlic for about 5 minutes. Add the next 11 ingredients (corn through freshly ground pepper) and cook until heated through. 2. Empty two cans of enchilada sauce in a large bowl. Dip each corn tortilla in the sauce. Lay on a flat surface, and place about 1/3 cup of the bean/hominy mixture down the center. Roll up and place in the baking dish. Repeat until all tortillas are used (or you run out of filling). Spoon any remaining enchilada sauce over the tortillas, as well as the contents of the third can. 3. Cover pans with foil and bake for 45 minutes. Uncover and top with vegan cheese if using. Bake for an additional 10 minutes or until enchiladas are browned. Top with salsa and vegan sour cream. Serve with a salad or Spanish rice. As with most soups, this one tastes best on the second day. 1. Carefully sort through peas and rinse. Place peas in large stewpot with onion, carrots, and broth. Add enough water to cover ingredients. Bring to a boil and cook on medium heat for 30 minutes, stirring occasionally and adding water when necessary to keep peas covered. 2. Add salt, pepper, and spices. Reduce heat and simmer on medium-low heat for 1 hour. Stir often and occasionally add water to prevent soup from becoming too thick. Remove bay leaves and serve. Timing is everything when making candy, so prepare your utensils and measure your ingredients before you begin. A candy thermometer will ensure optimum results. Sue says this brittle is so tasty, it’s totally gift-worthy. 1. Grease a large cookie sheet with cooking oil spray and set aside. Combine the sugar, corn syrup, and water in a medium saucepan. Heat on medium heat until bubbling begins. Increase heat slightly until sugar mix comes to a full rolling boil, and insert candy thermometer. Boil, stirring constantly, until mixture reaches 300° (in about 5 to 10 minutes). 2. Remove thermometer; add nuts, vanilla, and baking soda to sugar mix. Stir quickly and immediately pour onto prepared cookie sheet. Work quickly, and spread mixture evenly. Allow to cool completely before breaking into small pieces. A chickpea is a garbanzo is a …cece bean, if you’re in Italy! Thanks to Sue for this stew recipe. Sauté potatoes, onion, and garlic in olive oil over medium heat, stirring occasionally, for 5-7 minutes or until onion is transparent and soft. Add broth and cook for 10 minutes. Add tomatoes, green beans, seasoning, salt, and pepper, and simmer over low heat. Cook 10 minutes, and then add cece beans and sugar. Simmer another 10 minutes, stir, and serve. If you’re expecting guests, roll out the red carpet and fix a batch of these caramel-pecan rolls for breakfast. They’re guaranteed to rival the offerings of your neighborhood java joint, and your guests may never leave. 1. To prepare dough, dissolve yeast in warm water in a large bowl. Let stand for 5 minutes; add salt. Stir in 3 1/2 cups of flour to yeast mixture. Dough will begin to pull away from the sides of the bowl. Turn dough out onto a floured surface and knead for about 10 minutes, incorporating the remaining flour until dough is smooth and elastic. Add more flour, a tablespoon at a time, if the dough sticks to your hands. 2. Grease a medium bowl with vegan margarine. Place dough in the bowl, cover with a clean dish towel, and let rise for about 1 hour in a warm place. 3. Meanwhile, prepare the caramel. Grease a 9-inch springform pan with vegan margarine and set aside. In a small saucepan over medium heat, combine brown sugar, vegan margarine, and corn syrup. Stirring constantly, heat until smooth and thick (about a minute and a half). Pour caramel into the bottom of the springform pan and spread evenly with a spatula. Sprinkle pecans over the caramel mixture and set dough aside. 4. Combine sugar and cinnamon in a bowl and set aside. When dough has doubled in size, punch it down and let it rise for about 5 more minutes. On a floured surface, roll dough out into a large rectangle. Spread margarine on dough with a butter knife, leaving a 1/2″ border around the edges, and sprinkle sugar over the margarine. 5. Beginning with the side of the dough closest to you, begin rolling the rectangle tightly into a log. Trim the edges off and discard. Slice the log into 1″ rounds and place them in the springform pan on top of the caramel. Cover with the clean dish towel and let rise until doubled in size (about 40 minutes). 6. Preheat oven to 375°. Bake caramel-pecan rolls for about 25 minutes or until golden brown. Remove from oven and invert pan onto serving plate (be careful!). Open the springform pan, carefully using a knife to help free any rolls that stick to the pan. Lift off the springform pan bottom to reveal the beautiful caramel-pecan topping. Your guests will be impressed! Before you prepare this soup, check your cupboards for tiny leftover amounts of grains, barley, lentils, etc. and feel free to substitute whatever you have on hand for the ingredients listed below. 1. In a large soup pot over medium heat, bring the broth, water, onion, carrots, celery, and garlic to a boil. Reduce heat to low, cover, and simmer for 15 minutes. Add the barley, lentils, split peas, and dried mushrooms. Continue to simmer for an additional 45 minutes. 2. Add the potato, zucchini, tomatoes, and spices and simmer for an additional 30 minutes or until the lentils and vegetables are tender. Serve hot with a rustic bread. When a reader asked for a vegan chocolate cake recipe, Sue took up the challenge in the test kitchens. The results are delicious. 1. Preheat oven to 350°. In a large mixing bowl, stir first six ingredients with a wire whisk. Add remaining four ingredients. Mix until smooth (about 1 minute). 2. Grease a 9x9x2 pan with canola oil or cooking oil spray. Pour batter into pan and bake in preheated oven for 30-35 minutes. Cool; dust with powdered sugar. Add 1 Tbs. flour and reduce oil to 1/4 cup. Bake at 375° for 30 minutes. Michelle, mother of five and a great vegan cook, submitted this recipe. You can set out the ingredients and let your guests make their own spring rolls. 1. Place the noodles in a bowl and cover with hot water. Soak for 5 minutes or until softened. Drain well and set aside. 2. Remove and discard the seeds in the cucumber by scraping a spoon on the center of each piece. Cut each piece into thin strips. 3. Fill a large bowl (at least several inches larger than the rice wrappers) with warm water. Soak one wrapper until soft and pliable, 20-30 seconds. Remove the rice wrapper from the water and lay flat on a counter or cutting board. Place 1-2 tablespoons of spinach leaves along one edge of the wrapper. Place an equal amount of noodles over the spinach. 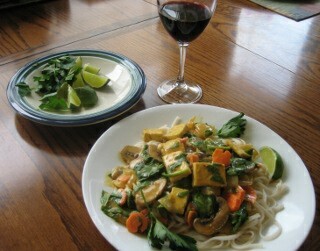 Top with 1 tablespoon of carrot matchsticks, several pieces of cucumber and tofu, and a basil or mint leaf. 4. Roll the wrapper, starting with the filling side, folding the ends over the filling as you roll and forming a tight cylinder. Serve with small bowls of peanut sauce for dipping. If you’ve never made homemade bread, this is a good introductory recipe. It’s easy! The dough needs time to rise, so save this recipe for a leisurely afternoon. Use fresh rosemary for the best (and most fragrant!) results. 1. In a small saucepan, heat olive oil, rosemary, and garlic until aromatic. In a large mixing bowl, whisk together water, active dried yeast, and salt. Add olive oil, rosemary, and garlic and stir. Add 4 cups of flour and stir until combined. Knead the dough in the mixing bowl with your fingers for about 3 minutes. Gradually add the remaining flour until the dough is soft, not sticky. If it’s still sticky, knead in extra flour until the dough is soft. 2. Cover bowl tightly and let dough rise in a warm place until doubled in size, about one hour. (I like to preheat the oven on the warm setting, turn the oven off, and let the dough rise in the oven with the door slightly open). Gently poke the dough with your finger. If your finger imprint remains, it’s ready. 3. Brush oil on a 10″ x 12″ rectangular baking pan. With oiled fingers, stretch the dough evenly over the baking pan. Cover and let rise for about 45 minutes. 4. Preheat oven to 400°. Brush top of dough with olive oil and decorate with rosemary sprigs. Bake for about 25 minutes or until golden brown. Maybe you’ve heard of a classic dessert called a fruit fool? Sue found an English recipe for strawberry fool that dates back to 1764! The basic recipe consists of berries and an equal amount of cream, with sugar added. After blending well, the consistency is similar to a pudding. Some modern recipes use cream and yogurt. Sue came up with this veganized version. YUM. Try it. It’s easy and fast. Blend in a food processor; chill. That’s it! Sue worked hard this week to create the Asian-inspired dressing for this salad, a perfectly blended balance of sweet, salty, spicy, and tart flavors, with none overpowering the other. Her husband loves it. 1. Place dressing ingredients into small mixing bowl and mix well with wire whisk. 2. Slice green onion bunch in half, and discard dark green half. Chop onions and place in large mixing bowl. Add remaining ingredients and set aside. 3. Pour dressing over salad ingredients, mix well, and refrigerate.